Ezekiel 12:2: Son of man, you are living among a rebellious people. They have eyes to see but do not see and ears to hear but do not hear, for they are a rebellious people. A couple of years ago, I was making another pass through the New Testament, and I was struck by the number of times Jesus said, “For those who have eyes to see, let them see, and for those who have ears to hear, let them hear.” I began to meditate on that phrase, and realized that the implication of those statements are that not everyone has eyes to see or ears to hear. This quote from Jesus in Matthew 13 helped me understand in a deeper way. Matthew 13:15-17: For this people’s heart has become calloused; they hardly hear with their ears, and they have closed their eyes. Otherwise they might see with their eyes, hear with their ears, understand with their hearts and turn, and I would heal them. But blessed are your eyes because they see, and your ears because they hear. For truly I tell you, many prophets and righteous people longed to see what you see but did not see it, and to hear what you hear but did not hear it. I began to understand why some things God made clear to me were not at all obvious to others. I started to pray for eyes to see and ears to hear, and realized these were gifts from God. It is the Spirit that gives us wisdom and understanding. For years, like Solomon, I have been praying for the gift of Wisdom. What I did not recognize was that these prayers opened me to see things that had been in front of me the whole time, yet I had not been able to see them. This spring, as we sat outside enjoying the beautiful Atlanta spring, I saw woodpeckers among the trees. We are used to seeing Downy Woodpeckers, and an occasional Red-headed Woodpecker, this bird was different. I could not quite see him, flicking around in the leaves of the tree, but heard his distinctive call. So, I got out my iPhone, and pulled up the Audubon Birds App. If you like to identify birds, check out this app. It’s expensive, but exquisite. I listened to the calls of the Woodpeckers that are found in this region, and finally recognized the trill call we heard as coming from the Red-bellied Woodpecker. Once I had listened to the call, I started hearing it every day. Every walk through the neighborhood, every time we sit on the porch, I hear the trill of this bird. Rarely can I see the bird in the dense foliage, but I know he’s present, because now I have ears to hear his call. So, even though I had been surrounded by the presence of the Red-bellied Woodpecker for years, I did not have eyes to see or ears to hear. Once I got this bit of wisdom from Audubon, I could hear them all around me. A month or so ago, I attended a 3DM Taster. I was quite taken by this simple power equation that Steve Cockram shared at the event. I realized that I could increase the power of God flowing through my life if I could reduce my resistance to God’s will. Since that day, I pray each morning that the Spirit might strengthen me so I could turn from my selfish desires, and that God would shape me to be that which He would make of me. Some amazing things have happened. People keep crossing my path who are wounded or in some place of deep need. As I have made myself available, and kept my focus on Him, grace-filled moments have multiplied, and God is using me to touch people with His grace. I went on to say that after a few weeks, the newness of this experience began to dim, and my sense of God’s presence also dimmed. To this he responded, “It’s like taking a step up. At first the terrain looks new, but after we have been walking for a while, the newness wears off. That does not mean that you have stepped back down from that step, just that it is becoming familiar.” It’s like mountain climbing. Each time you reach a new plateau, the views are stunning. But, there is still another hill to climb. Make it to the next shelf, and another vista unfolds. But it is still a false summit. Keep climbing and the reward at the top will be incredible. Romans 12:2 Do not conform to the pattern of this world, but be transformed by the renewing of your mind. Then you will be able to test and approve what God’s will is—his good, pleasing and perfect wil. So, let me get this straight, after my mind is transformed, I can know what God’s will is. Before transformation, everything is cloudy. After, I can test and approve what God’s will is. 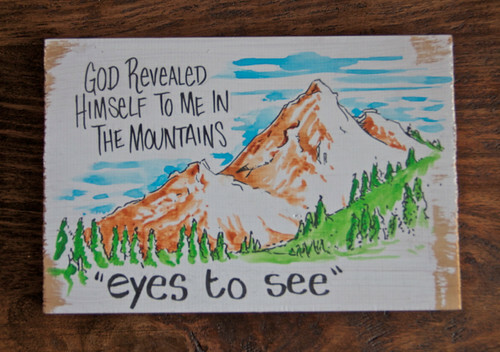 So, part of transformation is that we can receive eyes to see and ears to hear God’s perfect will. What an incredible blessing. Makes me wonder why so many in the traditional church shudder at the thought of transformation and the call to discipleship. Perhaps, as it said in Matthew 13, we have calloused hearts, and close our eyes and refuse to listen. And the great multitude of these churches are on plateau or in decline. Jesus in John 10 says he came to bring life, and to bring it abundantly. The Kingdom of God is breaking in, He tells us. But, in order to hear the small voice leading us into the Kingdom, before we see it, before we live into the abundant life, we must have eyes to see and ears to hear. Let me close with a few more scripture passages that hit this theme. Mark 4:22-24: For whatever is hidden is meant to be disclosed, and whatever is concealed is meant to be brought out into the open. If anyone has ears to hear, let them hear. May you pray for wisdom, and receive it. May you have eyes to see and ears to hear, so you might be transformed by the renewing of your mind, be able to see God’s faint path unfolding, and hear the still, small voice of the Spirit calling you forward into God’s perfect will.